Fig.1: Senescence of Miscanthus giganteus (miscanthus) plants, 1.5 m high, at the end of June 2013; paddock 22 Aylesbury farm. Miscanthus plants are now starting to senesce and pass nutrients to their rhizome (Fig. 1). First year-yields are not worth harvesting and so the remaining woody stems will stay in place until new growth commences next spring. Miscanthus planted in the irrigated paddocks of Aylesbury Farm achieved a maximum height of 1.5 m which is impressive considering the late planting and initial lack of irrigation. This growth was achieved from initially water-stressed plants in just four months. Expected height from growth over seven months was 1 m. Normally above-ground growth in the first year is not very extensive as most development is occurring underground in the rhizome. Strong rhizome development in the first year is very important in determining subsequent yield. The impressive above-ground growth achieved indicates the plants have equally impressive rhizome development and that next year’s growth should easily reach the anticipated 3 m in height which is needed for testing the multi-functional nature’s services generated by its role as a shelterbelt and biofuel source. Initially miscanthus was chosen for its ability to create shelter rapidly and of a significant height and also because of its ability to let the centre pivot to pass through it. The fact that it shows signs of providing exceptional yields is a bonus. The high yield and low input demand are the main factors why recent analyses conclude that miscanthus, in the (warm) temperate zone, is the bioenergy crop that seems able to deliver the highest net GHG mitigation. The highest net energy output was also found when peak, pre-senescence, yields were harvested. Sustainability of many first-generation biofuels – which are produced primarily from food crops such as grains, sugar cane and vegetable oils – has been increasingly questioned over concerns such as reported displacement of food-crops, effects on the environment and climate change. 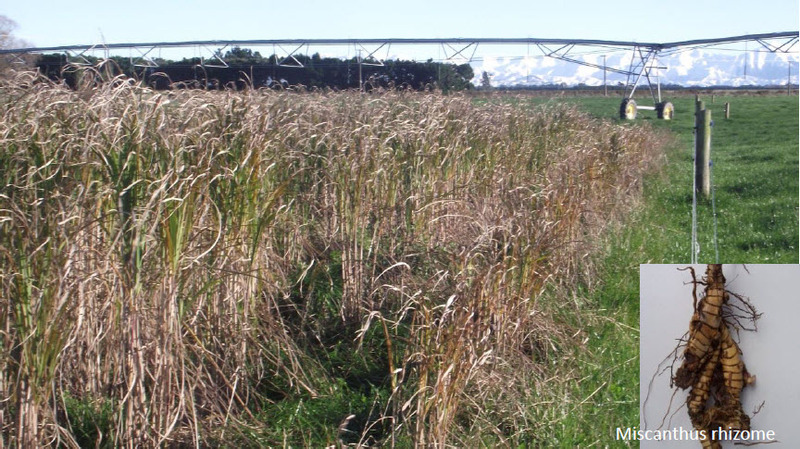 This increasing criticism has raised attention to the potential of so-called second-generation biofuels of which miscanthus, specifically M. giganteus, is an example. While second-generation biofuel crops and production technologies are more efficient, their production could become unsustainable if they compete with food crops for available land. The advantage of integrating miscanthus within the farming system is that the crop complements the existing farm production and is synergistic with it. In mid-May I was invited to give a presentation on my research to date at the Bioenergy Association of New Zealand (BANZ) Conference on ‘Unlocking additional revenue from traditional rural land use’ in Rotorua. This was well received and showed how well our research fits into the present direction that ‘future farming’ in New Zealand should be taking. Farmers can be conservative in terms of change, and adopting new farming systems will mainly be achieved only if farmers can be confident in the financial benefits and outcomes of doing so. With the (perhaps token) commitment of governments to reduce carbon emissions, the need to develop bio-energy crops to replace fossil fuels is a necessity. The advantage of using miscanthus is that until carbon credits etc. become a viable market, the crop has existing multiple uses, as feed or bedding material, shelter, wildlife and pollinator habitat and as a useful agro-ecologically based marketing tool. Sheltered areas of the paddock potentially have higher pasture production and quality. Part of this research is to investigate if this is the case. Pasture samples collected from miscanthus-sheltered and unsheltered areas of paddocks throughout last season are being analysed for digestibility, nutrient and energy content. Results will be used to determine base data for comparing any changes next season resulting from shelter. Thanks to Samuel Dennis’s team at Agresearch, yield maps based on pasture height readings collected last season using a C-Dax pasture meter have been produced. An example of one of these is illustrated in Fig.2. Fig.2: Grass yield expressed as plant height from paddock 22 on Aylesbury farm 22 Jan 2013. Every black dot represents a pasture height record from the C-Dax pasture meter. 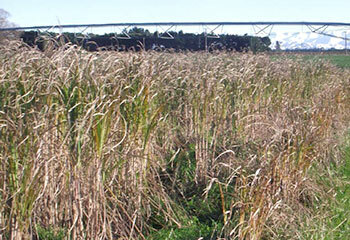 Concentrated readings are taken from the area immediately enclosed by the miscanthus shelter and from an equivalent-sized control area from the open paddock. The rest of the paddock is measured by towing the C-dax up and down the paddock at 10 metre intervals. The height readings are used to generate a map of pasture height over the whole paddock as illustrated by Fig.2. These will be repeated immediately before and after each grazing event over the next two years. 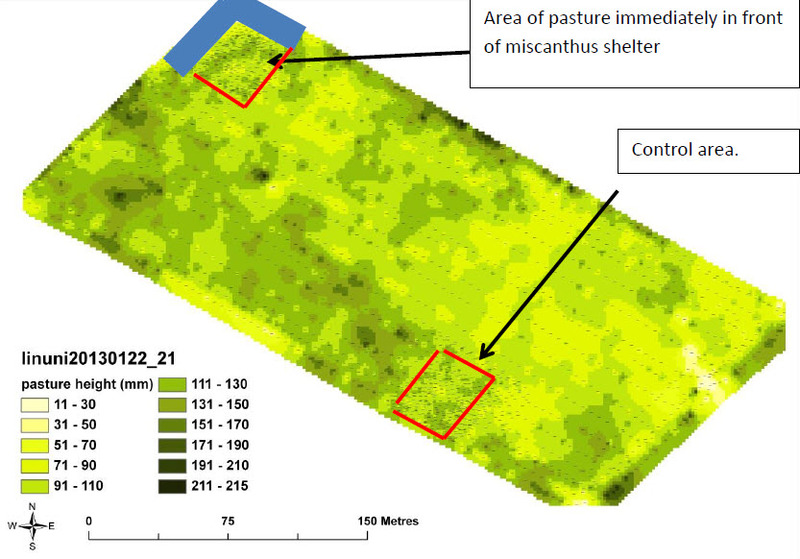 Results from six paddocks planted with miscanthus will be used, each with a control area at least 150 m away from any shelter and of equivalent size to the area immediately enclosed by miscanthus shelter. The control areas have been chosen to reflect as close as possible the physical features; soil depth, position relative to the centre pivot, proximity to paddock boundary and topography of the sheltered area. To interpret whether the presence of shelter has influenced pasture production changes relative to base values Before After Control Impact (BACI) analysis will be used. There will be six replicates with full irrigation. Three further paddocks with no or partial irrigation will also be measured. In July we are hoping to organise an open day at Aylesbury Farm. The aim is to illustrate, using existing plantings, how miscanthus can fit into the dairy production system. When the date has been finalised I will send an email to notify all recipients of this newsletter. Thanks again to all the funders and helpers who have and continue to assist in this research.